This manual contains guidelines for sampling natural and artificial bodies of water and snow sampling. It describes the procedure for determining the main physical properties of water including temperature, transparency, coloration, smell and total content of dredge and suspended particles. Quantitative analyses include acid estimation and oxygen content. Natural water contains many components that are found in low (less than 1%) and ultra-low (less than 1 one part per million) concentrations. In Russia, the state system of monitoring carries out the monitoring of natural and drinking water quality according to more than 50 parameters. In order to insure that water quality complies with special requirements, monitoring is carried out according to 100 or more components; many of them amount to one billionth and trillionth of a toxic substance (micrograms and nanograms of the substance per 1 liter of water). Certainly, such analyses are based on the application of modern and expensive equipment as well as the high qualifications of an analyst. This manual focuses on only the simplest parameters; their determination will allow students to make a preliminary conclusion on water quality and characterize the purity of the water body. This educational activity is aimed at water sampling from as many water sources as possible found within the vicinity of the school or field center as well as at comparison of some of the simplest physical and chemical properties of water taken from those sources. Empty plastic bottles with screw-caps (one bottle per each water source), a shovel or a scoop, a glass cylinder about 50 cm high, different test-kits for determining water properties and clean plastic bags are required for this assignment. When carrying out the given work, students should try to take water from a maximum number of sources in the area – both from natural water bodies and artificial ones. Water can be taken from local streams, rivers, lakes, ponds and water reservoirs (depending on their availability in the area) as well as from wells, water pipes, rainwater barrels, garden pools, etc. Snow samples should also be taken. Water sampling is an important part of water analysis and a necessary requirement for the reliability of obtained results and their applicability in practice. Mistakes arising from improper water sampling cannot be corrected later. There are a number of general rules of water sampling for further analyses regardless of the source of water samples. A standard type of container should be used as jars for all water sampling. At present it is more convenient to use clear 1-2-litre bottled water plastic bottles for these purposes. They should be washed beforehand without use of detergents and then dried out. Prior to water sampling, the bottle should be rinsed several times with the water under study. The bottle should be filled with water up to the very top and the cap should be screwed so that there is absolutely no air left in the bottle. In all water sources, the bottle should be immersed into water completely (with the exception of a faucet). It should be placed 10 cm lower the water surface so that water surface film does not go into the bottle. 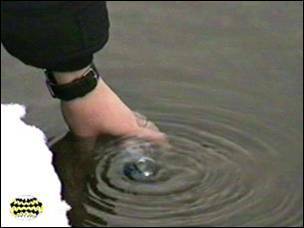 When sampling water, it is necessary to measure water temperature regardless of the water source. Temperature can be taken with the help of a regular thermometer, which should be immersed into water for a minute. The temperature should be read without taking the thermometer out of the water. When sampling water running from the faucet, the head of a thermometer is placed into the water current right at the faucet outlet. Each bottle containing a water sample should be labeled immediately at the sampling site. Students must also record details of the water sampling in their field notebooks. It is sufficient to write down the name of the water source and the number of the sample on the bottle in indelible marker. It is advised to write prior to sampling, when the bottle is dry. More detailed information is taken down in the field notebook. It usually includes the following standard data: the number of the water sample, the date, time and authors of the sample, geographical and local position of the sampling site (region, district, human settlement, name of the water body, position of the site in relation to other landmarks and so on (more details – the better). The method of water sampling should also be described (from a bank, from a boat, from a bridge, out of a well-bucket, from under a faucet, etc. ), as well as water temperature at the moment of sampling. After a sample has been taken, it is necessary to observe the basic rules of sample storage: it is advised to carry out the main analyses in the course of an hour from the moment of sampling (especially analyses of smell, transparency and oxygen content (if needed). Other parameters can be determined in the days after samples have been taken. If determination of water properties cannot be conducted at once, the sample should be preserved (each component or a group of substances is characterized with an independent procedure for preservation) or stored in the refrigerator at a temperature of 3-4 degrees Celsius no longer than 3-5 days.